Love this girls gold baroque print dress from Young Versace made in satin polyester and printed with the designer's signature baroque print. Perfect for any special occasion this Summer, the bodice is fitted and trimmed with grosgrain ribbon around the waistband and the skirt is tiered and flared. 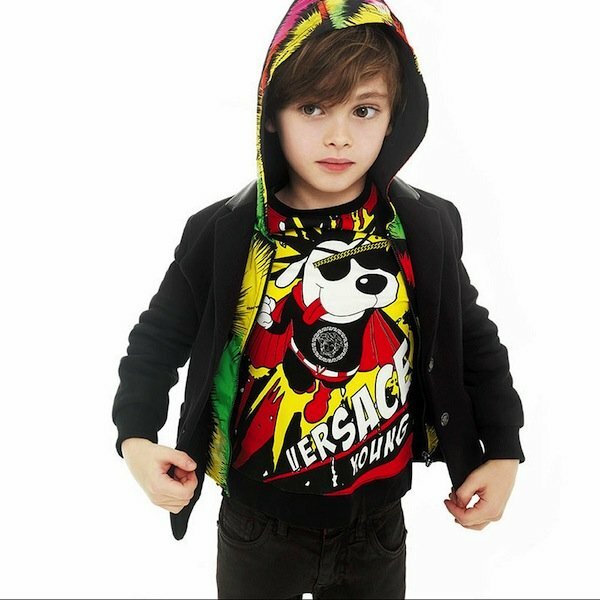 For boys, I love the Young Versace Barocco Black & Gold Outfit featuring this boys black and gold Borocco print shirt from Young Versace and matching Shorts with Gold Barocco Print. As part of the Young Versace Borocco Black & Gold Theme, complete the look with this matching YOUNG VERSACE Boys Black & Gold Baroque Print Cap and white Young Versace Leather Trainers.